Maps, whether printed or pixelated, are purely utilitarian for most people. 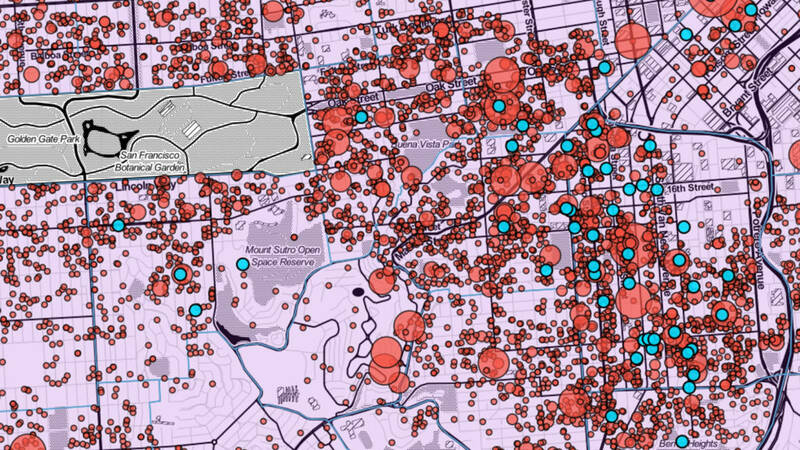 But to the Anti-Eviction Mapping Project, maps are a powerful, immediate way to measure change. 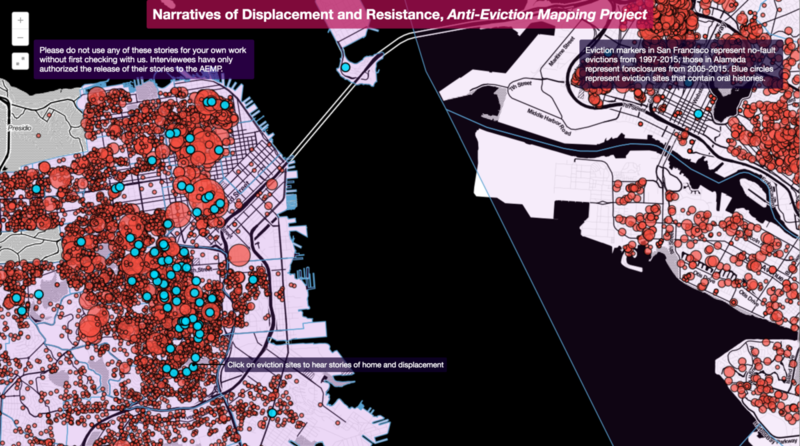 The collective's animated map of Ellis Act evictions in San Francisco between 1994 and 2014 looks like a time lapse of a city-wide military proving grounds, evictions blooming outward in circular explosions from SOMA, the Mission and -- really -- everywhere within San Francisco’s 49 square miles. 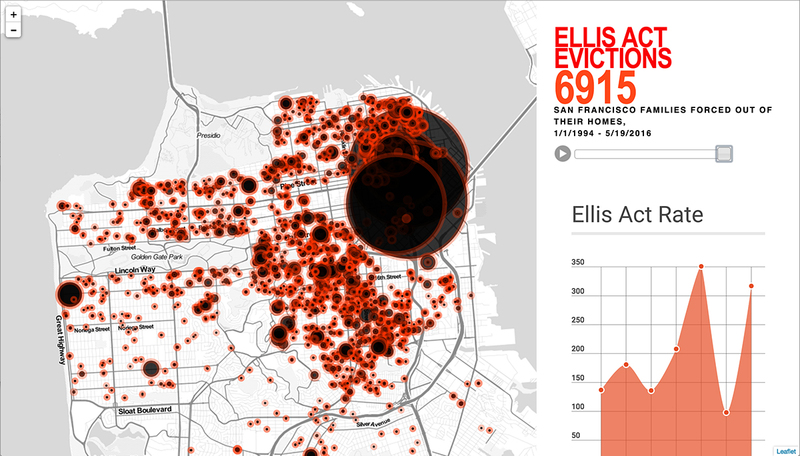 The data-visualization depicts evictions as sites of violence, with rippling aftereffects. As effective as this type of mapping is in providing a sense of history, scale and geographic trends, the data remain abstract: number of tenants evicted, addresses and dates. But the A(E)MP collective, a shifting group of mostly volunteer housing rights activists, community organizers and artists, doesn’t stop with numbers. Alongside number crunching and data-visualization, they operate a storytelling and qualitative side of their work, collecting narratives of displacement and resistance. Allowing people to tell their own stories -- of changing neighborhoods, fights against eviction, and experiences of homelessness -- in their own words, the A(E)MP profiles the differences and similarities between lived experiences in the current Bay Area housing crisis. Close to 100 oral histories, most around 1 hour in length, dot A(E)MP’s narrative map. I dove in for some deep listening with suggestions from Erin McElroy, one of A(E)MP's founding members. Her outlook on the neighborhood's future is bleak. “The second they started building condos on Mission Street, we just all need to find a new place to go,” she says. “I like not hearing gunshots outside my window at night,” she says, but change is not categorically good. “Of course neighborhoods change over time, but this is next-level, this is organized, this is purposeful,” she says of the displacement she sees around her. In 1997 Ingram suffered an injury that ultimately caused her to become disabled; she now uses a wheelchair. At almost the same time, she was evicted from her Mission district apartment during the Bay Area’s first tech boom. “It wasn’t a big deal then,” she says of the eviction in retrospect. “It was more of a rare occurrence.” Today? “I would say probably half or more of my close friends have been Ellis Acted out of the city,” she says. 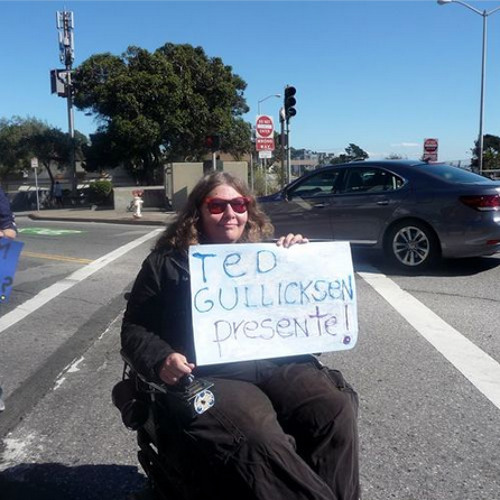 The tech buses that transport employees to and from Silicon Valley are more than just symbols of a changing economy and population for Ingram -- they’re physical obstacles she can’t surmount in her wheelchair. “The city just lets the tech buses operate here, but they don’t pay any attention to how it violates the rights of people with disabilities like me,” she says. When tech buses pull up to curbs, Ingram explains, MUNI buses are often forced to stop in the middle of the street, making it impossible for them to lower their wheelchair ramps. For now, Ingram’s living situation is stable, but she worries about what might happen if she lost her place in public housing. “I don’t have anywhere else to go,” she says. “This is my family and my home and everything. I’ve got tons of medical problems and this is where I’ve got it all set up. 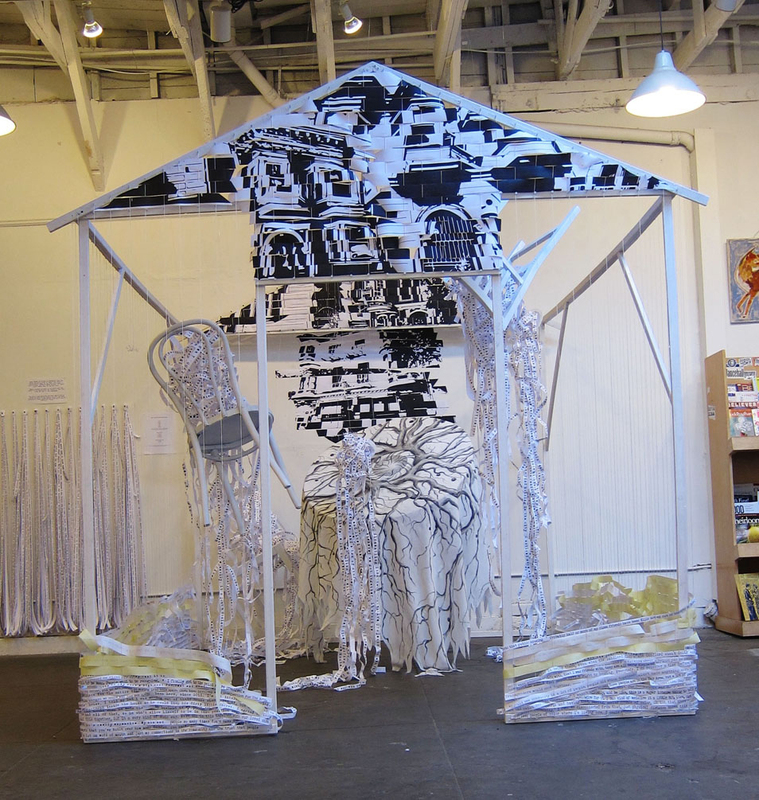 Zeph Fishlyn, 'Fabric: Raveling/Unraveling,' 2014. For Ingram's interviewer, Ingram's story hit very close to home. Fishlyn has been evicted three times in the last four years, helping 35 people move out of their homes in 2012 alone. 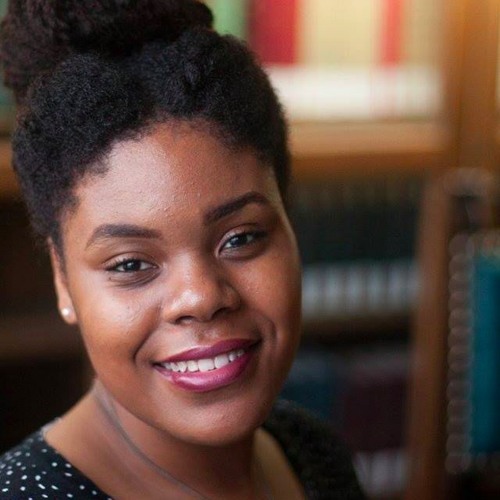 In addition to Ingram, Fishlyn interviewed about a dozen other subjects as part of Fabric: Raveling/Unraveling, a visual art project for the 2014 National Queer Arts Festival. Claudia Tirado was busy fighting an eviction notice from her landlord (the late Google attorney Jack Halprin) when Manissa Maharawal interviewed her for A(E)MP. 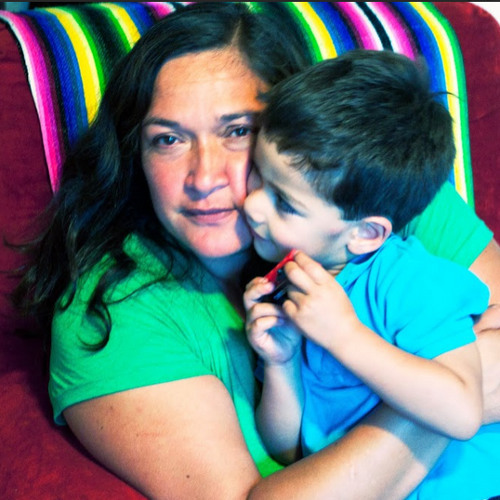 A mother and veteran third-grade teacher, Tirado, like Ingram, points to a growing empathy gap in the city. Tirado wants San Francisco to retain its spirit of acceptance and celebration of diversity. “We all have to respect each other and our differences. That’s what makes San Francisco awesome,” she says. Different worlds -- and different classes -- can and should coexist in the city. “I feel like...” she says before she trails off. Her voice breaks with emotion. “I just feel like a mother protecting her baby. 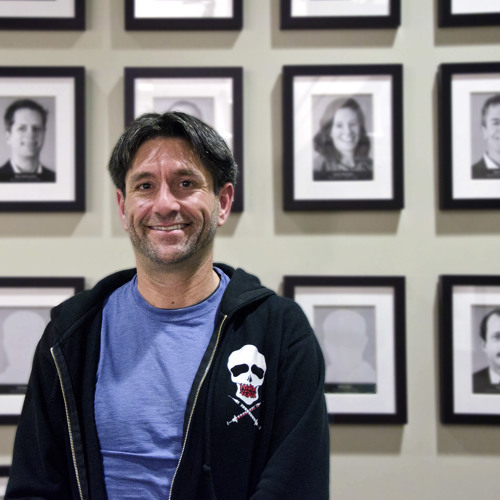 Michael Rouppet, an HIV positive man who was homeless for nearly a year after being evicted from his Alamo Square apartment, now volunteers with the San Francisco AIDS Foundation, providing services and resources to the city’s most disenfranchised people. On the street, Rouppet suffered debilitating cellulitis. It was other homeless people who took care of him. “The humanity that homeless people show each other, they taught me so much,” he says. While A(E)MP’s maps, murals and community events make visible the connections between global capital, real estate, high tech and the local political economy, what emerges from the oral history project are the effects of these entanglements on the city's most vulnerable individuals. To listen to someone’s story, told plainly and honestly, is to momentarily inhabit their world, their struggles and goals. Empathy, a quality so many of the oral history interviewees wish to see more of in San Francisco, is the inevitable result.